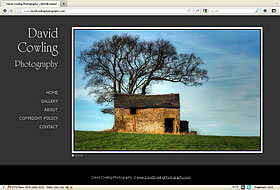 Website displaying & promoting the photography of Norfolk, UK based photographer David Cowling. Exactly what I was looking for! I needed a simple website that I could easily update myself. I can add my photos to the site using a user friendly photo management tool and I can edit the text on the pages. The design is just right - I wanted something clean, modern and simple that would show off my photographs. WDJ instantly understood what I wanted and produced a perfect site for my work. Great service and quality - fully recommended!